BIG BEND National Park can be intimidating. Countless photographs behold the region’s undeniable grandeur, its spectacular amalgam of desert, mountain, river, and sky. But the images also convey vast emptiness—16th-century Spanish explorers dubbed this territory el despoblado, “the uninhabited.” And those scenic photos often overlook the granular details, where scorpions, thorns, snakes, sunburns, and blisters reside. So it’s understandable when the uninitiated knit their brows at the thought of Big Bend, weighing a vacation experience against fears of a survival exercise in the Chihuahuan Desert borderlands. 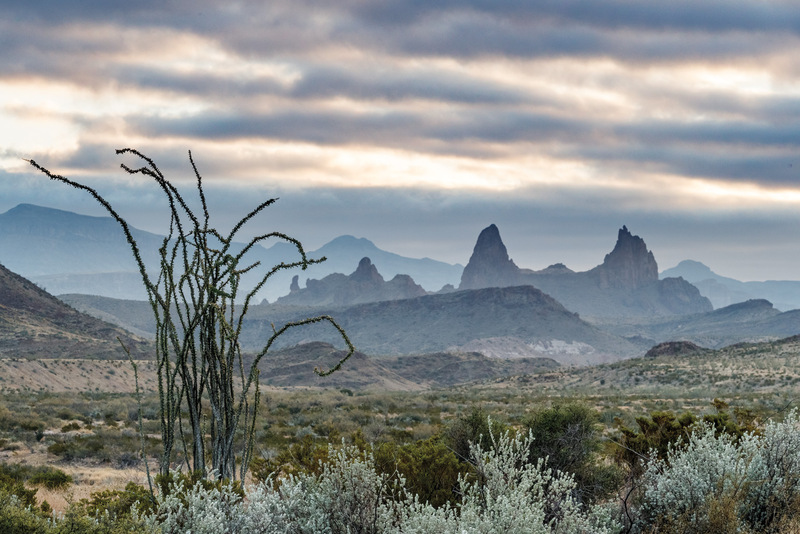 We’re here to tell you the characteristics that may sow trepidation about Big Bend—its isolation and wilderness—are the very qualities that make a visit to the national park worth a day’s drive across Texas. And that’s even if you’ve never put on a pair of hiking boots or pitched a tent; even if your preferred pastimes include drinking coffee on the porch, leisurely scenic drives, or riverside picnics with a guitar. From an overlook along the Ross Maxwell Scenic Drive, a distinctive pair of volcanic peaks known as the Mule Ears rises from the desert. One could easily wile away a day in the Chisos Basin, watching the sun bathe the volcanic ridges that frame the valley in shifting shades of peach and potato until darkest space descends and the stars burst forth. There’s no other place in Texas like it. Capitalizing on the scene, each of the Chisos Mountains Lodge’s 72 rooms has a porch or deck; and the lodge’s restaurant is surrounded on three sides by walls of windows. Several mountainous hikes embark from the basin, but walkers can find rewarding vistas with minimal effort on the Window View Trail, a 500-yard, ADA-accessible sidewalk loop that leads to an overlook perfect for photos. Point your camera west to capture the namesake window notch that opens to the desert floor, or to the east for a backdrop of the iconic lava dome called Casa Grande. 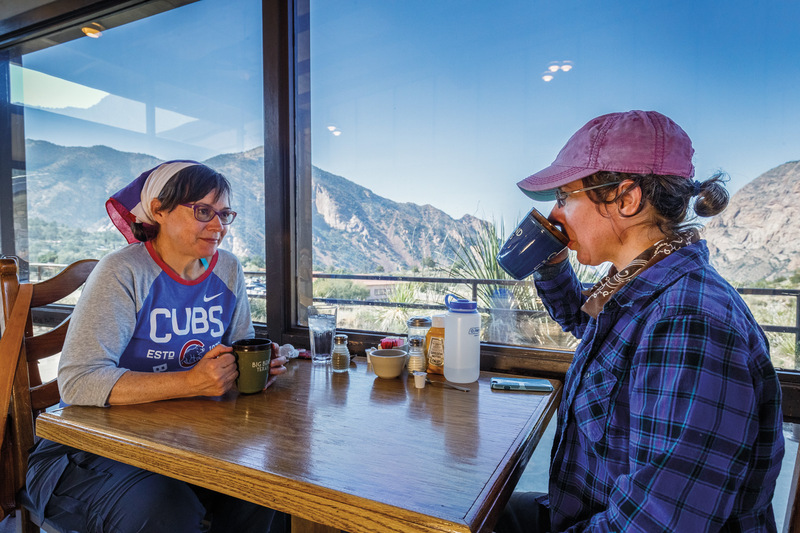 A coffee break at the Chisos Mountains Lodge restaurant. There’s no need to leave the basin for those contented with the restaurant’s three-meal service and the Basin Store’s selection of basics, including ice cream and six-packs of Big Bend Brewing Co. beer. But since most people have traveled hundreds of miles to get here, the venture down from the mountains to explore the Ross Maxwell Scenic Drive is well worth the time. Maxwell was a geologist and Big Bend National Park’s first superintendent, holding the job from the park’s founding in 1944 until 1952. He laid out this route to highlight spectacular rock formations along the road’s 30 miles as it descends 1,500 feet from the base of the Chisos to the Rio Grande. With trailheads and overlooks every few miles, the route spans hundreds of millions of years of geologic history and thousands of years of human history. “It’s just a little over an hour driving each way, but you can easily spend a day exploring,” says Tom VandenBerg, the park’s chief of interpretation. The Lower Burro Mesa Pouroff. If geology is your jam, don’t miss the Lower Burro Mesa Pouroff, a 1-mile round-trip hike that traces a majestic band of yellow volcanic ash as it swoops into a stunning box canyon and emerges on the other side like the silhouette of a falcon in flight. Such desert landscapes resonate with beauty far greater than any human hand could create. But pretty scenery doesn’t translate into an easy living. Only the toughest souls have thrived in these lands, and the Ross Maxwell Scenic Drive also sheds light on their experiences. At the Chimney Trails stop, a desert hike leads to rock pillars marked with indigenous paintings and carvings from archaic times. 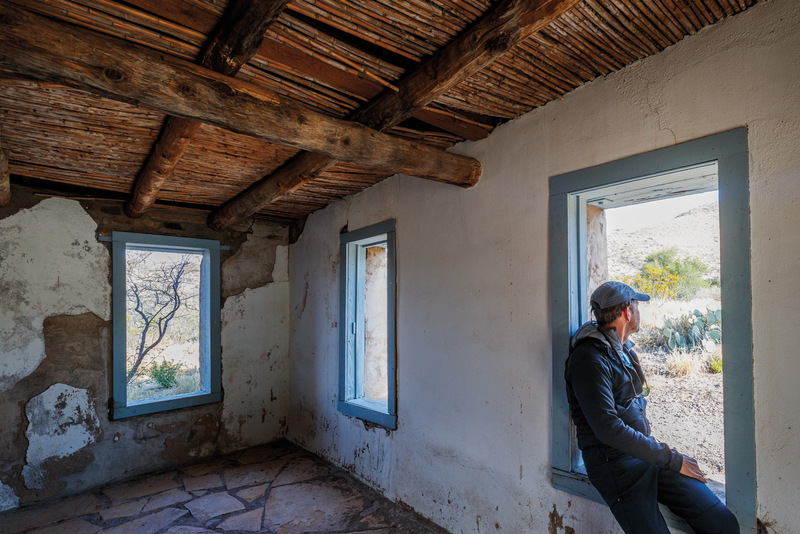 Along the scenic drive, Big Bend’s ranching heritage is on display at the Sam Nail Ranch, where a 5-minute walk leads to adobe ruins among a grove of walnut and pecan trees—a peaceful oasis with benches to watch birds drawn by the working windmill. At the Homer Wilson Ranch, an easy hike descends to Blue Creek Canyon, where a well preserved stone house recalls Wilson’s sheep and goat operation, which lasted until the park was formed. Closer to the Rio Grande, the settlement of Castolon is home to a camp store, shaded picnic tables, and bathrooms, as well as a visitor center that interprets local border history. The U.S. Army built this outpost in 1919 but withdrew a short time later when the Mexican Revolution ended. A farming community sprouted among the rich soils of the Rio Grande floodplain, where settlers built adobe homes and grew cotton and crops to sell to nearby cinnabar mining communities. Mesquite trees blanket the floodplain now, and as the scenic drive winds toward the river, it reveals occasional glimpses of historic adobe ruins, abundant roadrunners, and the nearby Rio Grande. 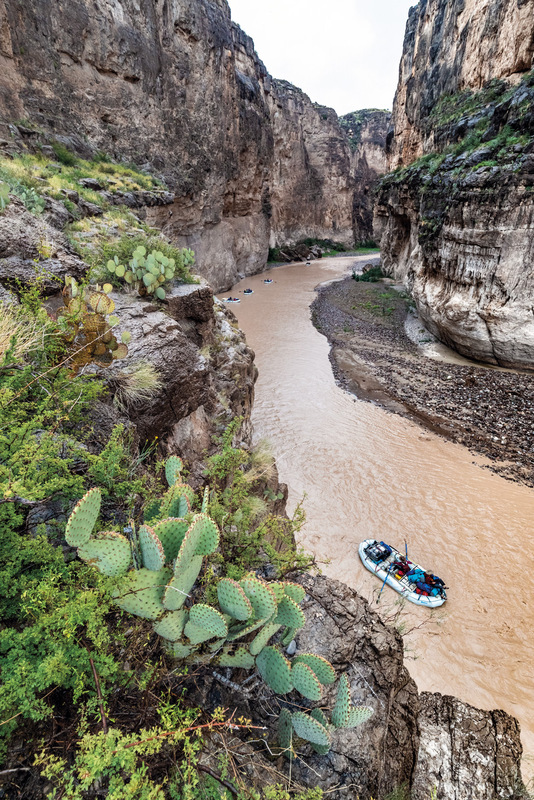 But the river’s grandeur and the proximity of Mexico aren’t fully apparent until the drive terminates at Santa Elena Canyon, a fitting coup de grâce. Here the Rio Grande cuts a sinewy 1,500-foot gash through a limestone block known on the American side as Mesa de Anguilla and on the Mexican side as Sierra Ponce. The historic foreman’s house at Homer Wilson Ranch. For generations, the gravel and mud beach at the canyon’s mouth has been a popular spot for picnicking, wading, international rock-skipping, and contemplating the massive fault that ruptured this bedrock millions of years ago. It’s also the starting point for a 1.6-mile round-trip hike into the canyon. As the trail ascends through rocky walls swimming with fossilized seashells, the canyon eventually closes the view forward as the trail ends, teasing hikers to the mysteries upstream. Looking back, however, offers a satisfying consolation: an expansive view of the park and the Ross Maxwell Scenic Drive’s twisting route through canyons, mesas, and mountains back to the Chisos. For Chisos Mountains Lodge information and reservations, call 432-477-2291; chisosmountainslodge.com. For more on the Ross Maxwell Scenic Drive, call Big Bend National Park, 432-477-2251; nps.gov/bibe. Gigantic alligators called deinosuchus once roamed the Big Bend. At the Fossil Discovery Exhibit, a life-size replica makes for a good photo op. It takes a certain degree of patience to relish an hours-long drive across the desert, even when navigating the magnificent scenery of West Texas. It’s fair to say most children get antsy. 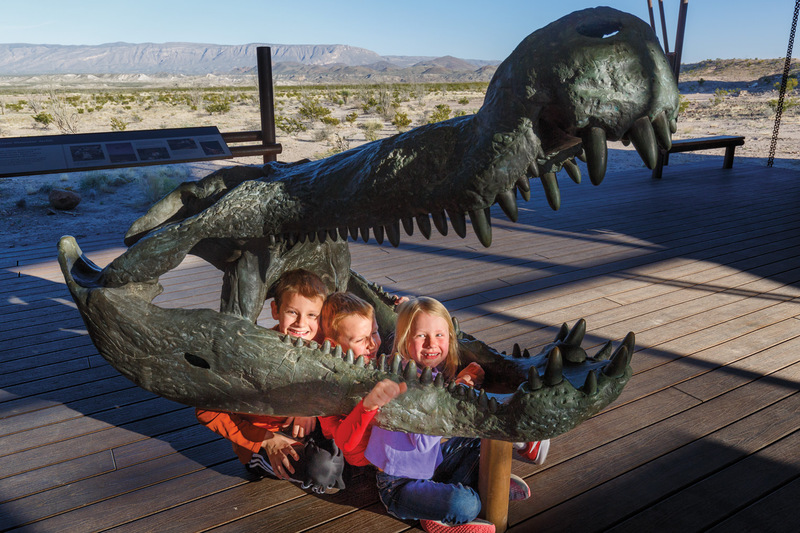 Not to worry: One of Big Bend National Park’s newest and most family-friendly stops—the Fossil Discovery Exhibit—is the first attraction visitors encounter when entering the park from the north at Persimmon Gap. With its opening in 2017, the exhibit not only enlightened the park’s interpretation of the fossil record contained in the surrounding hills, it also created an engaging place for kids to climb around among the creatures that have inhabited this place for the past 130 million years. Adults will find plenty to learn from the informative displays and unbelievable fossils that chronicle the area’s transformation from a shallow ocean of marine life, to swampy forests of dinosaurs, to a volcanic mountainscape of strange mammals. A guided hike at the Panther Junction Visitor Center. Shaded picnic tables offer a place to snack, and play hills embedded with replica fossils give kids a chance to burn some energy while getting a sense of the magnitude of dinosaur bones. A classic photo opportunity awaits with the life-size sculptures of T-Rex and deinosuchus heads, their open jaws inviting kids to stick their heads in. Speaking of deinosuchus, this fall the park unveiled a 38-foot steel cutout of the huge alligator that ruled the swamps of Big Bend some 80 million years ago. It’s a marvel, no matter your age. This type of active education is what the Price family had in mind on a perfect autumn day in November as they explored two kid-friendly trails in the eastern part of the park. Residents of Portland, Oregon, the family visited Big Bend as part of a school-year RV road trip to visit national parks across the country. 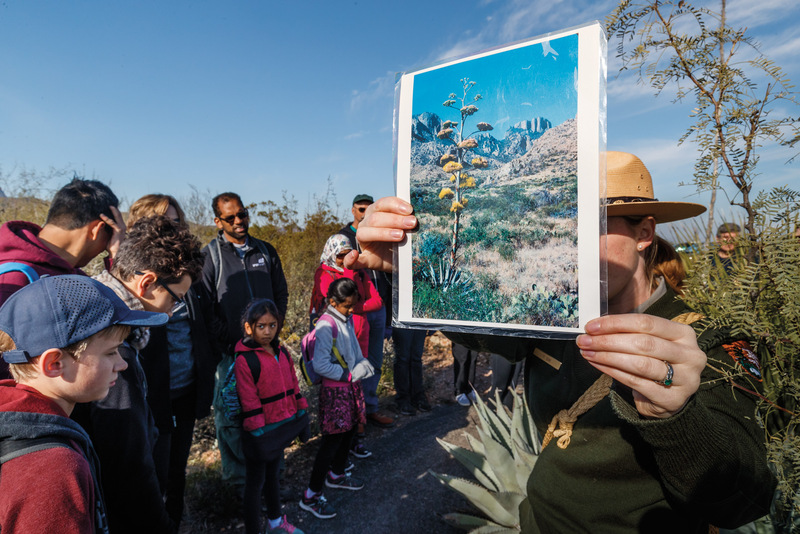 Mother Shana Price says she was using the park service’s Junior Ranger Program—workbooks that study each park’s science and history—as part of the year’s educational curriculum for her three kids, ages 10, 8, and 5. 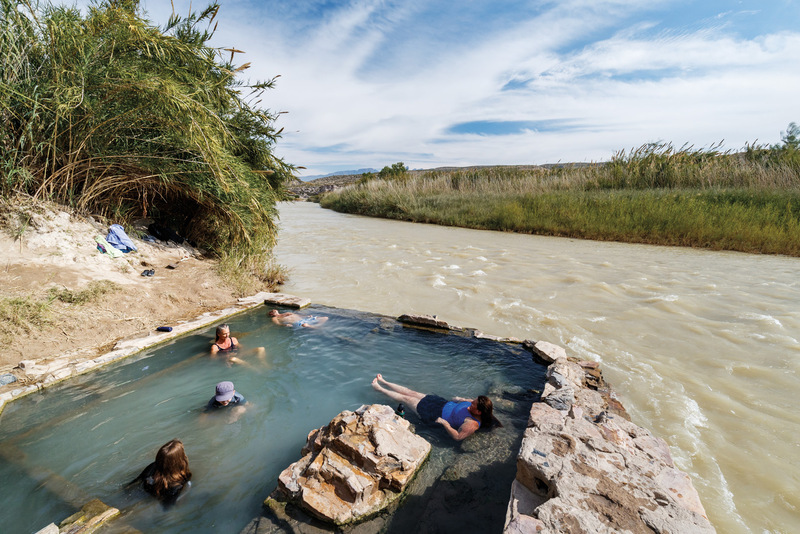 Hot springs along the Rio Grande. The Prices hiked the Hot Springs Trail, where the prize of swimming in hot natural pools motivates little legs for the half-mile round trip on a flat gravel path. The mineral spring water emerges at about 105 degrees into pools on the bank of the Rio Grande. It’s much more fun than bath time at home. 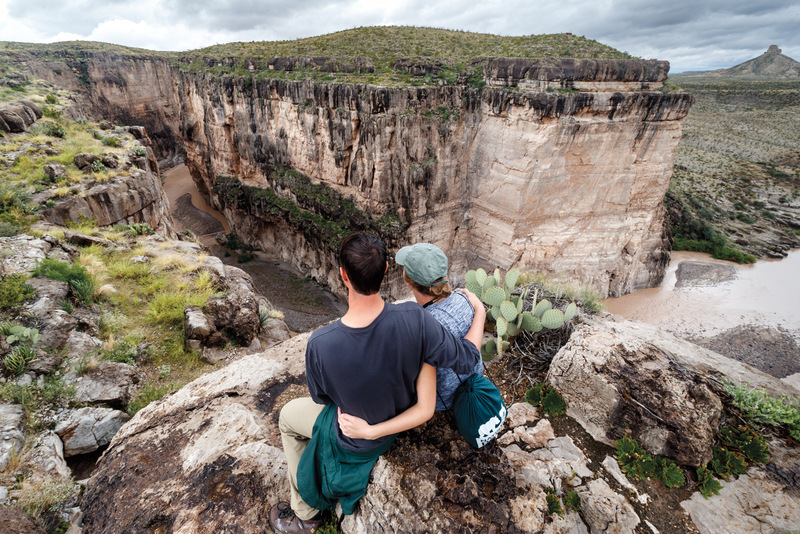 They also explored Boquillas Canyon Trail, a 1.4-mile round trip that climbs to an overlook with a view of a massive bend in the Rio Grande and a small Mexican farm on the other side—a strikingly different scene than daily life in an American city. 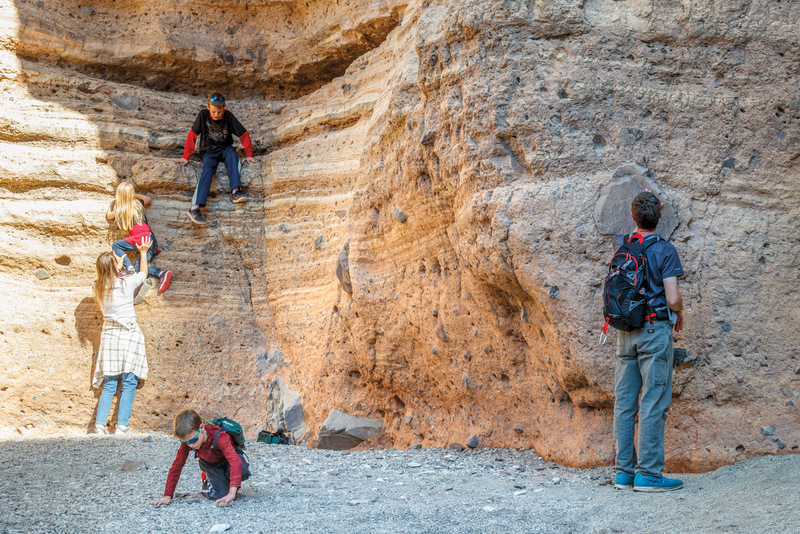 The trail then drops into the flood plain where children can roll in sand dunes against the canyon wall and rinse off in the river. If you’re lucky, Jesus, the singing cowboy of Boquillas, will be around, his Spanish folk songs resonating off the walls of the canyon. Find Junior Ranger workbooks at the Big Bend visitor centers; learn more about the program at nps.gov/kids/jrrangers.cfm. A flotilla of rafts entering Santa Elena Canyon on the Rio Grande. 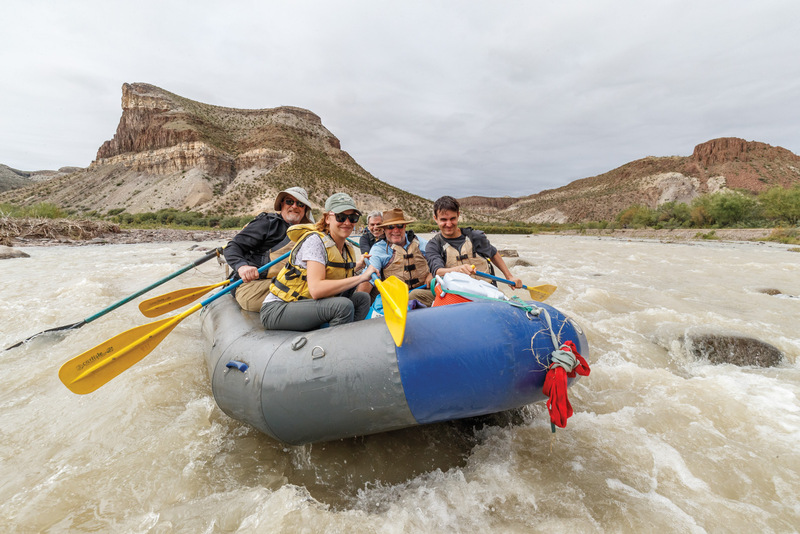 When you’re on a rafting trip on the Rio Grande, you’re absolutely nowhere else but on the Rio Grande. 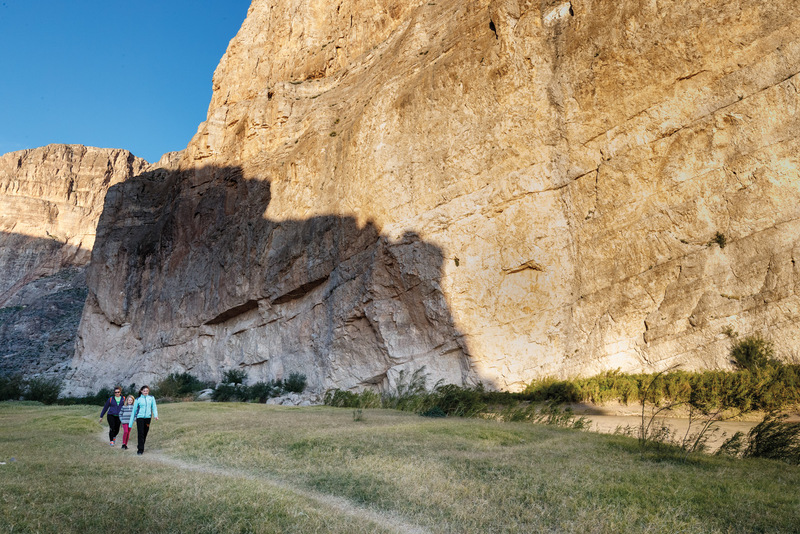 As simple as that sounds, it comes as an awesome epiphany to wake up in a riverside campsite surrounded by desert mountains of the Big Bend and the sheer limestone cliffs of Santa Elena Canyon. It doesn’t feel like Texas, nor Mexico, nor even Big Bend National Park. 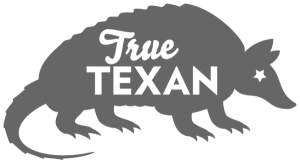 The nearest settlements are mere specks of civilization, and no roads span the miles to reach them. The only link to the rest of the world is the river, which courses by muddy and indifferent. With the river you have come, and with it you shall continue. This is what veteran rafting guide Steve Harris, the proprietor of Far Flung Adventures, calls “the real world,” and it’s the canvas for Texas River Music, a semiregular series of rafting trips complete with freshly prepared meals and nightly campfire performances by musicians such as Miles Zuniga and Butch Hancock. While a rafting trip may not qualify as luxury to some (tent-camping is involved), this version doesn’t feel like roughing it. Picture yourself seated on the river bank, watching an osprey soar overhead and dining on barbecued shrimp and filet mignon—all as a world-class songwriter picks out tunes and shares the quirky stories behind them. A Santa Elena Canyon overlook. 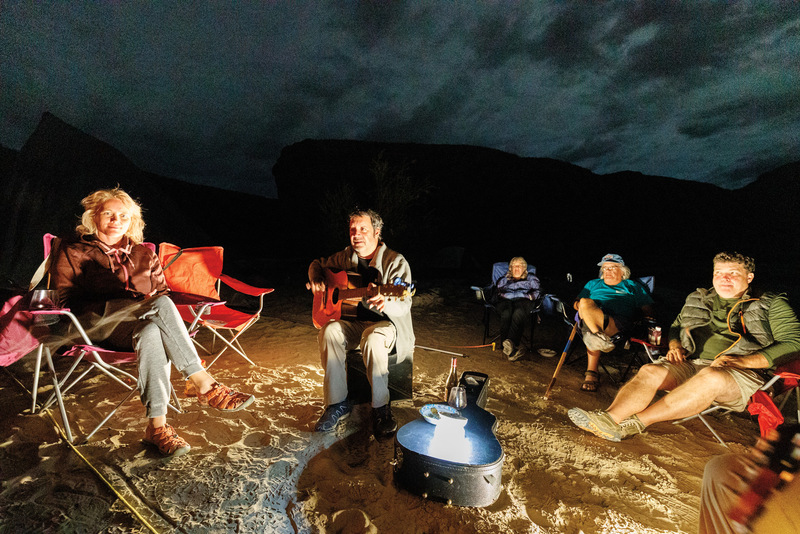 “The combination of the carefree environment that the guides create, along with the music and the opportunity to sit around and visit in this incredible environment—it’s just refreshing, especially in today’s world,” says Roger Allen Polson, an Austinite who has helped produce Texas River Music trips since 1988. The guides handle the heavy lifting throughout the 18-mile, three-day excursion—loading and unloading gear, captaining the rafts, setting up camp, and preparing the meals. Their outdoor kitchen turns out meals like chicken fajitas, salads, breakfast burritos, tuna-salad sandwiches, toasted bagels, and fresh fruit, along with plenty of hot coffee every morning. Throughout the float, the leathery river-runners share tall tales of past trips—Mick Jagger and Ann Richards have been down this route before—and note desert plants like the phragmites cane and palo verde trees that splash the banks in green. The trip climaxes on Day 3, when the party breaks camp and enters the famed Santa Elena Canyon. Cliff swallows and great blue herons welcome the rafts as a calming light sweeps overhead, the effect of sun rays ricocheting off 1,000 feet of creamy limestone cliffs. The next 8 miles pass as if in a psychedelic dream. The towering canyon shimmers in pastels of orange sherbet and butter with every ripple, dent, grotto, and sheen imaginable. Fossilized shells poke from the walls of ocean sediment, and ruddy stones rest on the bank after washing downstream for millennia. If you like jigsaw puzzles, it’s interesting to contemplate the angular townhome-sized boulders jutting from the riverside, trying to picture from where above they once toppled. Musician Miles Zuniga of Austin band Fastball plays tunes at a riverside campsite during a Texas River Music trip on the Rio Grande. 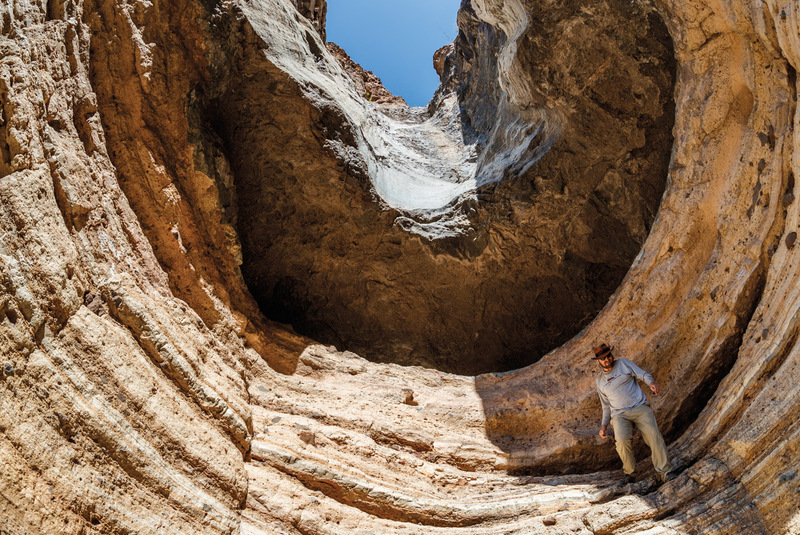 Harris, who has floated the canyon more than 100 times since the mid-1970s and even officiated weddings within its walls as a Universal Life Church pastor, says part of the fun of guiding canyon trips is reliving the thrill through the impressions of first-timers. Various outfitters offer guided Rio Grande river trips, visitbigbend.com/river-trips. Upcoming Texas River Music trips with Go Big Bend and Far Flung Adventures include a spring trip with Miles Zuniga (date TBD), Patrice Pike Oct. 18-20, and Butch Hancock Oct. 25-27; 432-386-5635; gobigbend.com/river-music-landing.